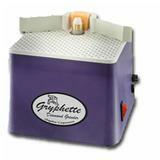 The Gryphette offers the best value in a glass grinder today. The small enclosure houses a surprisingly powerful DC motor. 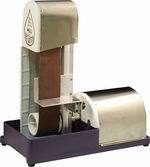 The Gryphette is the perfect grinder for the occasional glass artist, student or classroom. 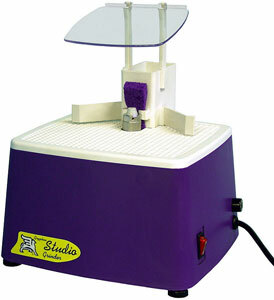 Getting straight, smooth, finished edges has never been easier! The high power, low maintenance motor will make fast work of your grinding, beveling and polishing needs. With an incredible 3inch wide sanding belt, available in 4 grits, finishing edges or creating custom bevels is a breeze. The built-in adjustable platform supports your project to prevent fatigue and keep a consistent angle.